Picked up a mini Hoosier sugar cream pie from Green City Market this morning and oh my goodness that is the best pie I've ever had. It's incredibly sweet, but in a mild way, the vanilla and cream flavors give it a kind of background marshmallow taste. To address the price issue, this mini pie was $7, but it's such an intense and sweet pie that I will take my time enjoying it. As opposed to the bacon buns I picked up at the market, which when paired with the butterkase from Prairie Pure and popped in the micro for 10 seconds are irresistibly snackable. Went by on Friday around 6pm and decided to pick up a pie, when I got there...there was only a few left, so I choose one of my favorites the mini lemon meringue. Now, I know someone mentioned earlier that they thought it was too tart, but for me, the flavors melded well together and the sweetness of the meringue and tartness of the lemon went so well together. This was the first time I have had a Hoosier Mama pie and it definitely will not be the last. The crust was nice and buttery and had a nice flake to it. Shaggywillis wrote: The crust was nice and buttery and had a nice flake to it. Does anyone know if that crust (the crust on any of her pies)has lard or is it just butter? And now I'm hearing a big piece on this place on NPR's "Morning Edition." Let the rush begin anew! pairs4life wrote: Does anyone know if that crust (the crust on any of her pies)has lard or is it just butter? I asked at the Wednesday Green City farmers' market the other day and was told 100% butter. Oh yeah - it's worth noting that Saugatuck Coffee Co. is selling Hoosier Mama pies by the slice. Particularly dangerous since it's right next door to my apartment. The woman behind the counter (perhaps the owner?) mentioned that they're also going to have quiche from Hoosier Mama. Got a chance to stop by Hoosier Mama on Friday. For lunch I had a slice of pork, apple and sage pie. The crust was flaky and buttery without being sweet. The filing was seasoned well with sage and a healthy does of grainy mustard. I will be back for lunch as soon as timing permits. I also purchased a small strawberry-rhubarb pie to nibble on over Memorial Day. The crust on the dessert pie was a touch sweeter, but not overly sweet and of course, flaky and buttery. The strawberry-rhubarb filling had equal amounts of both ingredients and was also sweetened, but no so much that you couldn't taste the natural flavor of the fruit. Loved this pie, both sweet and savory. abolt wrote: i stopped by hoosier mama last week to pick up a pie (closed on monday btw) hoping to get a coconut pie. not on the menu that day so went for hubby's favorite, lemon merinque. the pie was so tart we could not eat it. i think my husband finished his piece, daughter and i could not. ended up throwing 3/4 of it away. i was very disappointed and thought about taking it back but i figured it was a one off. i will try them again, crust was great, just not lemon merinque. anyone else experienced this? Shaggywillis wrote: Went by on Friday around 6pm and decided to pick up a pie, when I got there...there was only a few left, so I choose one of my favorites the mini lemon meringue. Now, I know someone mentioned earlier that they thought it was too tart, but for me, the flavors melded well together and the sweetness of the meringue and tartness of the lemon went so well together. This was the first time I have had a Hoosier Mama pie and it definitely will not be the last. The crust was nice and buttery and had a nice flake to it. I have been eating *a lot* of Hoosier Mama pie since the shop opened down the street from me; I've probably gone through the menu almost 3 complete times now (fyi: that's like a billion calories in filling and all-butter crust, not to mention the scones...). The lemon meringue may be my least favorite. I've had the opposite experience of abolt. I wanted a lot more tartness in the two Hoosier Mama lemon meringue pies I've had--the lemon was way too subtle for my liking, and there was too much meringue. I think my problem is that I have a gold standard for lemon desserts, which is the tarte au citron from a patisserie in the neighborhood I grew up in in Montreal. It's very tart with just a dollop of meringue, so I think I'm always looking for this ratio and therefore consistently disappointed by other lemon desserts. Picked up a small Hoosier Mama cherry berry at Green City, dense yet flaky crust, if that is not a contradiction, bursts of fruit sugar caramelization along the edges, intense mouth sticky fruitiness, one terrific pie. Small fed three people with some leftover. Because of its recent GNR nomination, I had been thinking about Hoosier Mama Pie Company for several days straight. Happily, I was in the neighborhood yesterday and decided to stop in for some pie. Needless to say, the trip did not disappoint . . .
Hoosier Mama Pie Company, at 1618 1/2 W. Chicago Avenue in Chicago. "Deluxe" is putting it mildly, in my opinion. At around noon, the shop was bustling with activity. Customers came and went and from what I could count, at least 6 people were working on pies. They had everything on the sign . . . and more! I checked to see if this case was on wheels because if it was, I might have tried to covertly hitch it to my car. We ordered a couple of slices. As was stated upthread, the pleasant staff will cut you a slice of any pie they have on-hand . . .
A glorious rendition with a perfect balance between the buttery crust and the sweet/tart fruit -- one of the best I've ever had. Just fantastic. Dense, sweet and chocolately. After the first 2 slices, we decided we had to have a couple more slices . . . This was fantastic, too. I thought that, perhaps, it would be too sweet but it wasn't at all. 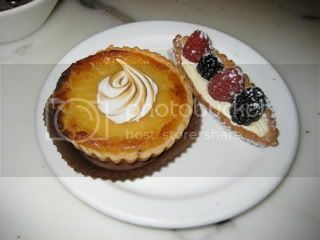 In fact, I loved the sweetness in combination with the slighly tangy and dense crust. 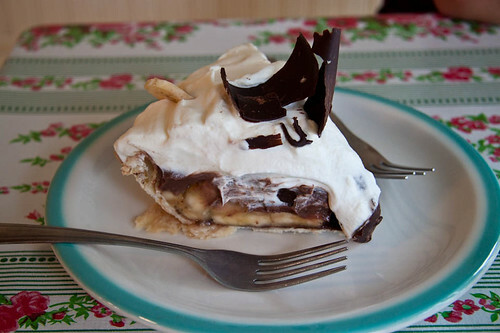 This pie sent my wife, who is a Hoosier, into a profound moment of food nostalgia. Based on the posts upthread, this may be the most controversial pie turned out by HMPC. On that basis alone, we decided to order it, even though I'm not usually a huge fan of lemon meringue. I have to say that neither the wife nor I really loved it. I liked the tartness of the lemon and the ratio of components but it was a bit too eggy for my taste. Absolutely love it! Do what you do and don't ever compromise. Even if you don't succeed, you'll never have to worry about looking yourself in the mirror. I'll admit that I still needed to eat some lunch after all the pie but only because I'm a creature of habit. That said, Hoosier Mama Pie Company is one of a very few places where I'd willingly and happily eat dessert before the meal. Honestly, I'm glad I don't live any closer to this place. It'd be downright dangerous for me. Thanks for the wonderful write-up, ronnie! I made it out there on Wednesday evening and ended up getting soaked even with an umbrella. The pie was worth it. They were out of chocolate chess, but keep in mind this was one hour before close, so I chose the chocolate cream as a backup. This was a winner in my book. Rich, velvety chocolate and a beautiful crust, it was gone before I could even conjure up the words to describe it! Thankfully, it's a mile walk from my apartment, so it's a safe enough distance away where I won't be tempted to make a daily trip, but boy would I like to. Service was very welcoming; they even have a highly-scientific recommendation system based on horoscope, for those who have trouble choosing. My only concern is the very tiny space. I have to think the presence of only 4 seats will be a problem, especially if this place starts getting the recognition it deserves. geno55 wrote: . . .they even have a highly-scientific recommendation system based on horoscope, for those who have trouble choosing. Well, by "highly scientific", I mean a printout of the daily horoscopes and a type of pie written down next to each Zodiac sign. YMMV, though: I was slightly vexed to find no pie written next to my own sign. Instead of accepting my pieless future, I went with my chocolate-loving gut. I think it worked out. You have to try the scones. Light and flaky just like a lighter pie crust, not the dense hockey pucks most places have. I usually try to go once per week just for the scones and muffins. shadesofjay wrote: You have to try the scones. Light and flaky just like a lighter pie crust, not the dense hockey pucks most places have. I usually try to go once per week just for the scones and muffins. I agree. I'm a big fan of their scones, mostly because they are truly scones . . . light, flaky, biscuit-like and lightly sweet. Too many places serve scones which are more like cakes or way too sweet or just don't have the buttery flavor that HM's scones have. Tried their Cherry Turnovers today at the GCM. Wow. It was some of the most incredible cream cheese pastry I've ever tasted and the cherry filling was perfect -- not too sweet, very bright cherry flavor, warm and encased in that delightful pastry, which was studded with crunchy sugar -- giving it just the best finish possible. I practically swooned all over the market. I swear the real reason I try to hit the market before 9 is Hoosier Mama. If you get there too late -- they're all out of everything. I have a peach pie and a mixed berry crumble top to look forward to later on. That woman is a genius. Normally Wednesday is my day to swing by the Green City Market for pie on my way to work. Since I worked from home - no pie. So, I stopped by the shop this afternoon to share a couple slices of pie. Once the blueberry and lemon chess had been dispatched with, a slice of chocolate cream with bananas was ordered to round things out. I know it is not much of a statement to say that I too am a pie lover. 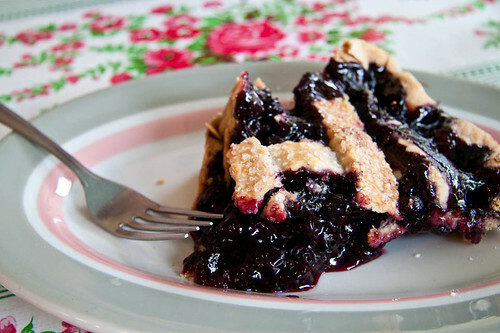 As far as fruit pies go, the blueberry pie at Hoosier Mama is the best pie that I have ever tasted. I know it's a travesty to order a peanut butter pie in the middle of fruit season, but I hadn't eaten at all last Friday and this peanut-butter lover couldn't resist. Light, airy but intensely peanutty filling, and lacking the "scorch" that you get in the back of your throat when you eat something too-sweet (which this was not), this pie qualifies as one of Best Thing[s] [I've] Eaten Lately. I couldn't finish the whole thing, and the remainder made for a treat later that night. My "one of the best things lately" from Hoosier Mama was the savory pork sage and apple pie last week, which (as I said on Twitter then) is probably, at $5, the best pork to value ratio in a city with lots of great pork dishes. In addition to the items I tasted recently at Hoosier Mama (documented above), I also bought a small chicken pot pie to take home that day, which was magnificent and unquestionably the best I've ever had. Other than its general design and shape, this CPP went its own way from beginning to end and in doing so, led to a completely new eating experience. I loved the cut-out silouhette of a chicken -- made from dough -- that was placed atop the deeply-flavorul, buttery and flakey crust. Inside much to my delight, I found plump peas, still with some snap to them, delicious chunks of carrot that still had some bite to them and -- best of all -- large, moist and delicious pieces of completely recognizable chicken. This was perfectly executed and as such, so completely different from any CPP I'd ever had before, that eating it was a revelatory experience. ronnie_suburban wrote: In addition to the items I tasted recently at Hoosier Mama (documented above), I also bought a small chicken pot pie to take home that day, which was magnificent and unquestionably the best I've ever had. Other than its general design and shape, this CPP went its own way from beginning to end and in doing so, led to a completely new eating experience. I loved the cut-out silouhette of a chicken -- made from dough -- that was placed atop the deeply-flavorul, buttery and flakey crust. Inside much to my delight, I found plump peas, still with some snap to them, delicious chunks of carrot that still had some bite to them and -- best of all -- large, moist and delicious pieces of completely recognizable chicken. This was perfectly executed and as such, so completely different from any CPP I'd ever had before, that eating it was a revelatory experience. But did it have a bottom crust as well? Also should add that the sauce in the CPP -- of which there was an appropriately small amount -- was thick (not runny) and really tasted like it had been made with stock. In the last 24 hours, I've had tastes of four different Hoosier Mama pies; blueberry, chocolate cream, banana cream and Hoosier sugar cream. All of the pies I tried were stellar. The fillings are first rate and the crust...well let's just say that it's really good crust. The Hoosier sugar cream crust tasted to me much more buttery...almost cookie-like compared to the others, but the counter person insisted that the same crust is used for all pies. In any event, Hoosier Mama fills a previously gaping hole in the Chicago food scene. Finally, we have a place to go for great pie. The meringue folks out there who were disappointed by the lemon (though not because of tartness) should definitely try Hoosier Mama's passionfruit meringue--deeply satisfying on all counts. Perfect tartness (again, I generally like very tart), ratio of filling to meringue, consistency of passionfruit filling (a little thicker), with the taste of fruit front and center. 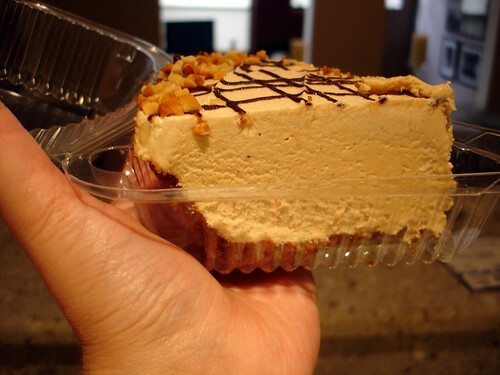 It's my favorite HMPC pie of the week. To add to all the either/or choices that you can use to falsely divide the world I have long used: cake or pie. Myself, I'm a pie man through and through. And so it was on Tuesday, that I basically organized an evening around trying this heretofore unsampled pie place and sampling as many Hoosier Mama Pies as possible. A friend and I strolled in around 5:30 and it still seemed like they had plenty of pies to choose from. Our plan was to sit down and eat two right there and then walk out with two more sliced to be eaten after dinner. These pies were fantastic. I had read about people's enthusiasm with some skepticism, noted the relatively high prices and unique pie varieties - but after trying the pies, I will gladly return, close my eyes, point and try anything they put out. I was most nervous about the Sugar Cream because I thought, like Ronnie, that it would be too sweet. It turned out that it did not approach cloying at all and possessed a slightly molasses or smoky flavor that offset the sweetness quite well. The filling on the triple berry was just delicious - the right mix of sweet and tart berries that tasted like summer. The crust on the triple berry was outstanding. Just about the flakiest, most flavorful crust I can remember eating in some time. Like stevez, I also thought that the crust on the sugar cream pie seemed different than the others - and maybe cookie like was a good term. It seemed less flaky, but both crusts matched their respective pies perfectly. As we we got up to go, we encountered tragedy - the apple-blueberry mini pie we had been eying had been snatched up during our pie-eating revelry. No matter, a slice of it and the peach to go, please! Seeing the partially sliced pies on the rack behind the counter, I innocently asked how they keep the cut pies fresh overnight. "We bake them fresh every day," was the reply. Puzzled for a second, I read between the lines and asked "So each of these pies... find a good home?" Three people looked up and nodded gravely. Oh, the peril of working in a pie shop! Our peach pie came from a pie that had been uncut until 2 minutes before closing. One employee looked over and noted that he hadn't been able to take home a peach pie in 2 weeks (probably because there were no cut pies leftover at the end of the day). You're welcome, I said. Perhaps because of all of this leftover pie talk, or perhaps because of their genuine friendliness, the counterwoman jogged after us when we turned to leave, handing over their last boxed up slice of strawberry rhubarb pie. Ha, as if they already didn't have a repeat customer! We only managed to eat the peach pie after a masa-laden evening at Huraches Dona Chio. And it was very good, although the crust suffered somewhat in the plastic container for a few hours. Unfortunately, a toaster oven wasn't an option in the kitchen we were in, but I highly recommend this for any cut-up takeaway pies. The apple blueberry slice I snagged for myself warmed up beautifully at home. I would not have thought of combining these two fruits, but again, wonderful. I cannot wait for a return trip. 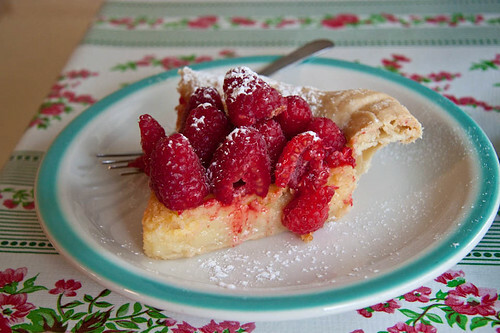 I am trying to organize a savory/sweet pie evening with some friends - hopefully as soon as this week. Savory pie note: In addition to the chicken pot pie and the pork, apple and sage pie, a man behind the counter said they were doing a lamb and apricot pie with Moroccan spices! a man behind the counter said they were doing a lamb and apricot pie with Moroccan spices! Yes, I've had the hand-pie version of it at Green City Market. It's very nice, but the pork sage and apple one is the standout for me among their savory pies. I purchased her vinegar chess pie at the Green City Market yesterday. It was flaky, sweet but with a slight sour note, featured a very delicate custard, specks of vanilla bean and it was just fantastic.